The articles, which were published in English, dated from the year 1980 to 2017, were included in this review. The search terms for articles were either in the title or abstract. Full-text original research articles were taken. Unpublished articles in press and personal communications were excluded from the study [Figure 1]. Articles whose abstract are only readable. 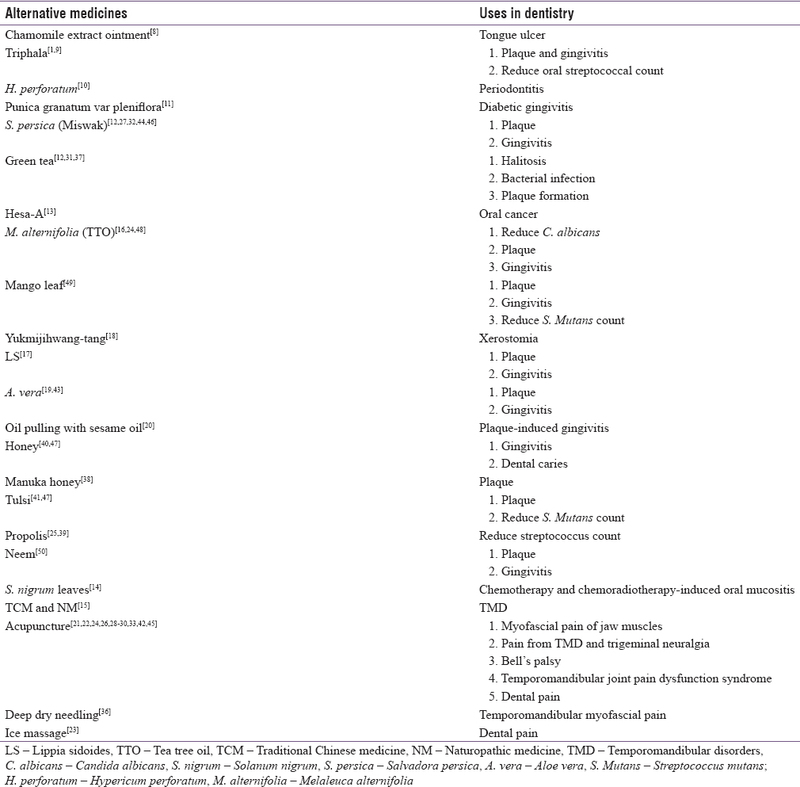 All the 43 articles, which are included in this review, show better efficiency of different alternative medicinal interventions for various oral diseases [Table 1]. Oral cavity is the mirror image of the whole body; hence, appropriate treatment of oral diseases is needed on time. 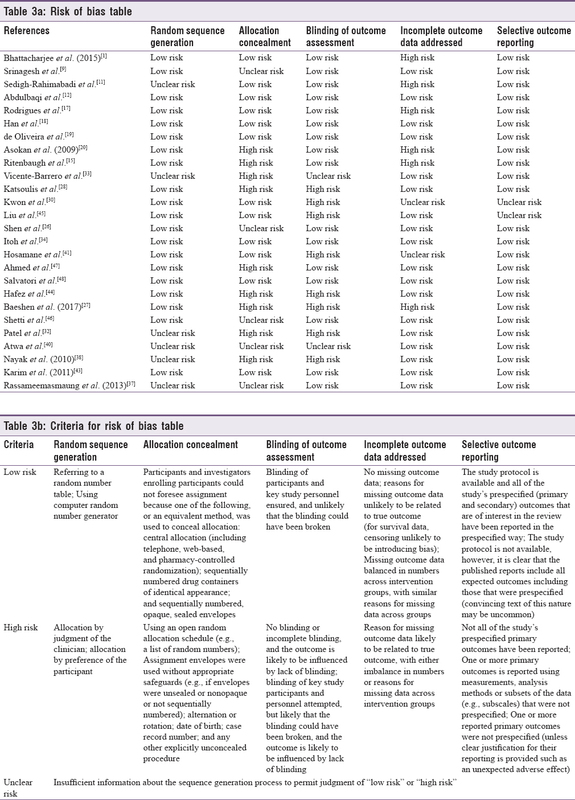 In a developing country like India, dentistry is unaffordable for many people especially of low socioeconomic status, and in such conditions, complementary medicine can help a lot [Table 2]. Treatment with no side effects is an attractive advantage of these complementary alternative medicines. Many studies are there showing the effectiveness of various complementary alternative medicines. The present study aims to find all the available alternative medicinal interventions for oral diseases. Despite advanced medical treatments, going natural is the new trend reflecting in the field of medicine. This is because of low expense with fewer side effects of the natural treatment methods. Improper awareness about the available alternative medicines and their applications is acting as a roadblock in this field. Hence, proper studies and researches should be anticipated for further development of natural alternative treatments [Table 3]a and [Table 3]b.
Bhattacharjee R, Nekkanti S, Kumar NG, Kapuria K, Acharya S, Pentapati KC, et al. Efficacy of triphala mouth rinse (aqueous extracts) on dental plaque and gingivitis in children. J Investig Clin Dent 2015;6:206-10. Xu P, Gunsolley J. Application of metagenomics in understanding oral health and disease. Virulence 2014;5:424-32. Mangal B, Sugandhi A, Kumathalli KI, Sridhar R. Alternative medicine in periodontal therapy – A review. J Acupunct Meridian Stud 2012;5:51-6. Spector ML, Kummet CM, Holmes DC. Complementary and alternative medicine in predoctoral dental curricula: An exploratory survey of U.S. Dental schools. J Dent Educ 2013;77:1610-5. Stoyell KA, Mappus JL, Gandhi MA. Clinical efficacy of turmeric use in gingivitis: A comprehensive review. Complement Ther Clin Pract 2016;25:13-7. Nakajima M, Arimatsu K, Minagawa T, Matsuda Y, Sato K, Takahashi N, et al. Brazilian propolis mitigates impaired glucose and lipid metabolism in experimental periodontitis in mice. BMC Complement Altern Med 2016;16:329. Longo RE, São Dimas J. Effects of Chamomilla recutita (L.) on oral wound healing in rats. Med Oral Patol Oral Cir Bucal 2011;16:716-21. Srinagesh J, Krishnappa P, Somanna SN. Antibacterial efficacy of triphala against oral streptococci: An in vivo study. Indian J Dent Res 2012;23:696. Paterniti I, Briguglio E, Mazzon E, Galuppo M, Oteri G, Cordasco G, et al. Effects of Hypericum perforatum, in a rodent model of periodontitis. BMC Complement Altern Med 2010;10:73. Sedigh-Rahimabadi M, Fani M, Rostami-Chijan M, Zarshenas MM, Shams M. A traditional mouthwash (Punica granatum var pleniflora) for controlling gingivitis of diabetic patients: A Double-blind randomized controlled clinical trial. J Evid Based Complementary Altern Med 2017;22:59-67. Abbasi MM, Helli S, Monfaredan A, Jahanban-Esfahlan R. Hesa-A improves clinical outcome of oral carcinoma by affecting p53 gene expression in vivo. Asian Pac J Cancer Prev 2015;16:4169-72. Patel A, Biswas S, Shoja MH, Ramalingayya GV, Nandakumar K. Protective effects of aqueous extract of Solanum nigrum Linn. Leaves in rat models of oral mucositis. ScientificWorldJournal 2014;2014:345939. Ritenbaugh C, Hammerschlag R, Calabrese C, Mist S, Aickin M, Sutherland E, et al. A pilot whole systems clinical trial of traditional Chinese medicine and naturopathic medicine for the treatment of temporomandibular disorders. J Altern Complement Med 2008;14:475-87.
de Campos Rasteiro VM, da Costa AC, Araújo CF, de Barros PP, Rossoni RD, Anbinder AL, et al. Essential oil of Melaleuca alternifolia for the treatment of oral candidiasis induced in an immunosuppressed mouse model. BMC Complement Altern Med 2014;14:489. Han G, Park JW, Ko SJ, Son J, Seon J, Kim J, et al. Yukmijihwang-tang for the treatment of xerostomia in the elderly: Study protocol for a randomized, double-blind, placebo-controlled, two-center trial. Trials 2013;14:281. Naik PN, Kiran RA, Yalamanchal S, Kumar VA, Goli S, Vashist N, et al. Acupuncture: An alternative therapy in dentistry and its possible applications. Med Acupunct 2014;26:308-14. Huang YF, Lin JC, Yang HW, Lee YH, Yu CH. Clinical effectiveness of laser acupuncture in the treatment of temporomandibular joint disorder. J Formos Med Assoc 2014;113:535-9. Melzack R, Guité S, Gonshor A. Relief of dental pain by ice massage of the hand. Can Med Assoc J 1980;122:189-91. Duailibe SA, Gonçalves AG, Ahid FJ. Effect of a propolis extract on streptococcus mutans counts in vivo. J Appl Oral Sci 2007;15:420-3. Baeshen H, Salahuddin S, Dam R, Zawawi KH, Birkhed D. Comparison of fluoridated Miswak and toothbrushing with fluoridated toothpaste on plaque removal and fluoride release. J Contemp Dent Pract 2017;18:300-6. Katsoulis J, Ausfeld-Hafter B, Windecker-Gétaz I, Katsoulis K, Blagojevic N, Mericske-Stern R, et al. Laser acupuncture for myofascial pain of the masticatory muscles. A controlled pilot study. Schweiz Monatsschr Zahnmed 2010;120:213-25. Noiman M, Garty A, Maimon Y, Miller U, Lev-Ari S. Acupuncture for treating temporomandibular disorder: Retrospective study on safety and efficacy. J Acupunct Meridian Stud 2010;3:260-6. Kwon HJ, Kim JI, Lee MS, Choi JY, Kang S, Chung JY, et al. Acupuncture for sequelae of Bell's palsy: A randomized controlled trial protocol. Trials 2011;12:71. Moghbel A, Farjzadeh A, Aghel N, Agheli H, Raisi N. The effect of green tea on prevention of mouth bacterial infection, halitosis, and plaque formation on teeth. Toxicol Res 2011;5:502-15. Patel PV, Shruthi S, Kumar S. Clinical effect of Miswak as an adjunct to tooth brushing on gingivitis. J Indian Soc Periodontol 2012;16:84-8. Vicente-Barrero M, Yu-Lu SL, Zhang B, Bocanegra-Pérez S, Durán-Moreno D, López-Márquez A, et al. The efficacy of acupuncture and decompression splints in the treatment of temporomandibular joint pain-dysfunction syndrome. Med Oral Patol Oral Cir Bucal 2012;17:e1028-33. Itoh K, Asai S, Ohyabu H, Imai K, Kitakoji H. Effects of trigger point acupuncture treatment on temporomandibular disorders: A preliminary randomized clinical trial. J Acupunct Meridian Stud 2012;5:57-62. Barrella GE, Suffredini IB, Ribeiro FV, Cirano FR, Pimentel SP. Evaluation of the effect of an organic extract obtained from ipomoea alba L. On experimental periodontitis in rats. Braz Oral Res 2012;26:158-64. Gonzalez-Perez LM, Infante-Cossio P, Granados-Nuñez M, Urresti-Lopez FJ. Treatment of temporomandibular myofascial pain with deep dry needling. Med Oral Patol Oral Cir Bucal 2012;17:e781-5. Nayak PA, Nayak UA, Mythili R. Effect of Manuka honey, chlorhexidine gluconate and xylitol on the clinical levels of dental plaque. Contemp Clin Dent 2010;1:214-7. Hegde KS, Bhat SS, Rao A, Sain S. Effect of propolis on Streptococcus mutans counts: An in vivo study. Int J Clin Pediatr Dent 2013;6:22-5. Atwa AD, AbuShahba RY, Mostafa M, Hashem MI. Effect of honey in preventing gingivitis and dental caries in patients undergoing orthodontic treatment. Saudi Dent J 2014;26:108-14. Hosamane M, Acharya AB, Vij C, Trivedi D, Setty SB, Thakur SL, et al. Evaluation of holy basil mouthwash as an adjunctive plaque control agent in a four day plaque regrowth model. J Clin Exp Dent 2014;6:e491-6. Grillo CM, Wada RS, da Luz Rosário de Sousa M. Acupuncture in the management of acute dental pain. J Acupunct Meridian Stud 2014;7:65-70. Karim B, Bhaskar DJ, Agali C, Gupta D, Gupta RK, Jain A, et al. Effect of Aloe vera mouthwash on periodontal health: triple blind randomized control trial. J Clin Periodontol 2011;13:14-9. Hafez SF, Ahmed M, Sadek AM, Bahy HS. Oral care as a preventive measure of VAP; Miswak versus chlorhexidine and toothbrush, a prospective, controlled, randomized, non-blind study. Int J Curr Microbiol App Sci 2015;4:723-32. Liu ZD, He JB, Guo SS, Yang ZX, Shen J, Li XY, et al. Effects of electroacupuncture therapy for bell's palsy from acute stage: Study protocol for a randomized controlled trial. Trials 2015;16:378. Shetti NA, Metgud R, Pattar V, Hugar SS. Salvadora persica (Miswak) mouthwash: A promising home care agent. Anna Dent Spec 2016;4:6-9. Ahmed SI, Reddy VC, Sudhir KM, Kumar RK, Srinivasulu G. Effect of tulsi extract and honey mouth rinses on salivary Streptococcus mutans count in comparison with 0.2% of chlorhexidine: A randomized controlled trial. J Public Health Dent 2017;15:306-11. Salvatori C, Barchi L, Guzzo F, Gargari M. A comparative study of antibacterial and anti-inflammatory effects of mouthrinse containing tea tree oil. Oral Implantol (Rome) 2017;10:59-70. Bhat SS, Hegde KS, Mathew C, Bhat SV, Shyamjith M. Comparative evaluation of Mangifera indica leaf mouthwash with chlorhexidine on plaque accumulation, gingival inflammation, and salivary streptococcal growth. Indian J Dent Res 2017;28:151-5. Jalaluddin M, Rajasekaran UB, Paul S, Dhanya RS, Sudeep CB, Adarsh VJ, et al. Comparative evaluation of Neem mouthwash on plaque and gingivitis: A double-blind crossover study. J Contemp Dent Pract 2017;18:567-71.